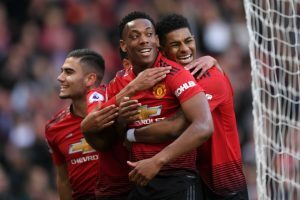 On Saturday in Week 32 of the Premier League, Manchester United beat Watford while Huddersfield got relegated after losing at Crystal Palace as part of the 3pm kick-offs on Citi 97.3 FM. 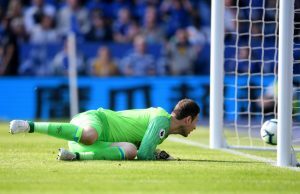 Southampton held on for a 1-0 win over Brighton at the AMEX Stadium which also boosted the Saints’ prospects and ultimately confirmed Huddersfield’s fate. 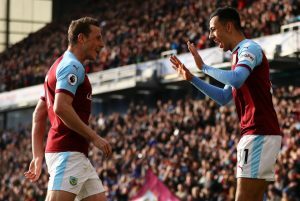 Conor Coady’s second-minute own goal gave the Clarets a dream start and although the visitors dominated for much of the second period, 19-year-old Dwight McNeil fired home the second goal in the 77th minute. Huddersfield’s defeat at Selhurst Park confirmed their relegation from the Premier League. Wilfried Zaha was brought down in the area by Juninho Bacuna, referee Lee Probert had little choice but to award the 76th-minute penalty that essentially consigned the visitors to relegation. The reliable Milivojevic confidently finished down the middle as Hamer dived, giving Palace the lead. Zaha then sent Van Aanholt clear in the 88th minute and watched as the full-back shot at an angle past Ben Hamer and into the back of the net. Jamie Vardy’s 82nd-minute header sealed a comfortable 2-0 win for Leicester over Bournemouth. The Foxes had taken the lead in the 11th minute through Wes Morgan and Vardy’s late intervention confirmed a third straight win under new boss Brendan Rodgers. Ole Gunnar Solskjaer’s first match as permanent Manchester United boss ended with a victory at Old Trafford thanks to goals from Marcus Rashford and Anthony Martial. Abdoulaye Doucoure scored late on for the impressive visitors but it was United who moved up to fourth with the win.